Everyday, an estimated 1.4 million people in Los Angeles County experience food insecurity, which means that 16% of Angelenos do not know where their next meal is coming from. Help provide these individuals and families with nutritious food by running a food drive out of your home, business, or community space! Setting up a food drive is easy. 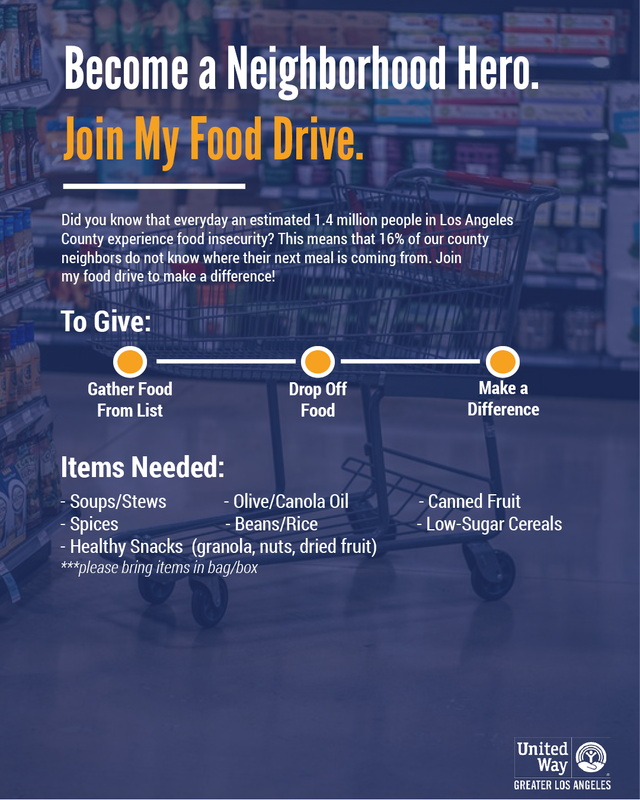 Let United Way of Greater Los Angeles provide you with the tools to build your own food drive and create an immediate impact in your community. We suggest running your food drive for one week, but it can range from one day to a whole month to fit your needs. No special skills are required or this activity! This activity will address the community needs of hunger, poverty, and community awareness. There is no age limit for this activity so you can get your whole community involved! 1. Register Your Food Drive. Fill out the food drive registration form here and our staff will reach out to make sure you have all the tools you need to create a successful drive! Talk with your United Way of Greater Los Angeles engagement consultant if you have any questions. 2. Pick Your Crew & Set the Date. Get a team of family, friends, and neighbors to help you organize and execute your drive. Then pick a start and end date that works best for your team (we suggest making your drive at least one week long). Get at least four large boxes to hold your collected food. For added fun, be sure to decorate your boxes with friends and families to give your food drive some special flavor. (need to buy boxes? You can purchase here). 4. Get The Word Out About Your Drive. Use the United Way Outreach Toolkit to let everyone know how they can help with your food drive through flyers, emails, and social media. 5. Start Your Drive and Get Collecting! Start your food drive and begin collecting your own and other people’s donations. 500 cans/items of food is a great goal! As you start collecting be sure to take lots of pictures to send to us after your drive. Once your food has been collected and the end date has past, call the food shelter nearest to you from the list provided and deliver your food! Be sure to thank everyone who took part in your food drive and send them a thank you email/flyer. A simple thank you can go a long way! Once your food drive is completed, please fill out our short DIY event recap survey to let us know how your event went so we can further help amazing volunteers like you! Don’t forget to send in pictures of your drive to [email protected]. What kind of food can I collect? Click below to download flyers, email templates, and social media posts that you can use to make your canned food drive as effective as possible! Where Can I Drop Off Food? You can use the list below to find the food bank nearest to your canned food drive location. We encourage you to call your intended drop-off location to let them know when you will be dropping items off.